SKOWHEGAN — It’s been just over one year since the Somerset County Sheriff’s Office started using electronic ankle bracelets to track domestic violence offenders, and those involved with the project say so far it’s been successful. In the last year, the electronic monitoring bracelets, which alert law enforcement if a defendant enters a prohibited area, such as a victim’s home or workplace, have been used in 15 cases, including eight domestic violence cases. Among the domestic violence cases, there was just one violation, and it was not related to the defendant having contact with a victim. “It’s given us a tremendous tool to keep track of domestic violence offenders, especially serial offenders who seem to victimize the same person over again and over again,” said Mike Pike, a domestic violence investigator for the Somerset County District Attorney’s Office, referring to the bracelets. Pike and others in law enforcement were part of a panel discussion Wednesday night at the Skowhegan Town Office following a domestic violence awareness vigil in Coburn Park. Both events were part of a “speak-out” organized by the Family Violence Project and local law enforcement to raise awareness about domestic violence, since October is Domestic Violence Awareness Month. In Skowhegan alone, there have been 35 domestic violence-related arrests to date this year, according to Skowhegan police Chief Don Bolduc. He said his department has responded to more than 80 calls of domestic disturbance. 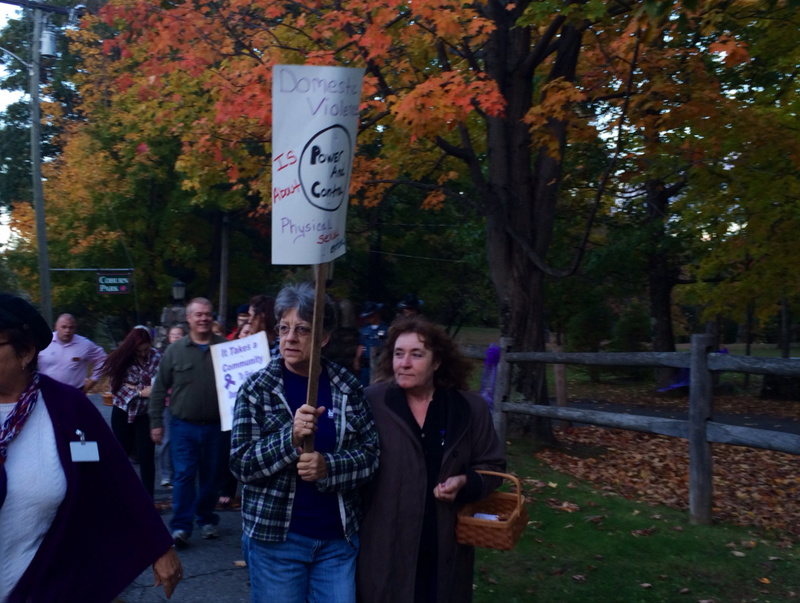 The Family Violence Project tries to organize awareness events each October, said Nan Bell, a community educator at the Family Violence Project, a nonprofit group that works to end domestic violence. Last year Kelly Guay, a friend of Amy Bagley Lake, a victim of domestic violence who was killed by her husband in 2011, presented the county with a $15,000 check to start the electronic monitoring program. Lake and her two children were killed by her husband, Stephen Lake, in a triple-murder and suicide in Dexter in 2011. The electronic monitoring bracelets — first employed in Somerset County on Oct. 10, 2014 — are most commonly used in pre-trial cases. The program does not cost taxpayers anything, as the bracelets are rented by the county and defendants pay daily to wear them. One of the biggest assets of the program is that it allows victims to feel safe, said Maeghan Maloney, the district attorney for Kennebec and Somerset counties. Teresa Brown, program manager for the Somerset County Community Corrections Program, oversees the set-up of the electronic monitoring systems, including mapping out areas where defendants are restricted from going and reviewing how the bracelets work with defendants. If a violation occurs, law enforcement is notified immediately and responds to both the victim and defendant, Maloney said. “We’re not just chasing the defendant. We’re on the phone with the victim and she stays on the phone with us until law enforcement arrives,” she said. Members of the panel, which also included Somerset County Sheriff Dale Lancaster and Bolduc in addition to Maloney, Brown and Pike, said the bracelets have been successful in preventing defendants from re-offending. Of the eight defendants who used the bracelets in the past year, there has been just one offense, which was a drug-related probation violation and did not involve the victim. When Somerset County started the program last year, it was the first in the state to do so. Since then law enforcement in Kennebec and Waldo counties have started electronic monitoring programs. The bracelets have been used mostly in pre-trial cases in which they are given to defendants who might otherwise be in jail while they wait to go to trial or have their cases heard. However, members of the panel said Wednesday night that they also have the potential to enforce sentences and prevent convicted offenders from re-offending. For example, last month Andrew Maderios, a 29-year-old music teacher from Pittsfield, was convicted of aggravated assault and domestic violence assault for a series of attacks against his former girlfriend. He was sentenced to 15 years with all but three years suspended and six years of probation, with the first two of those years to include electronic monitoring. 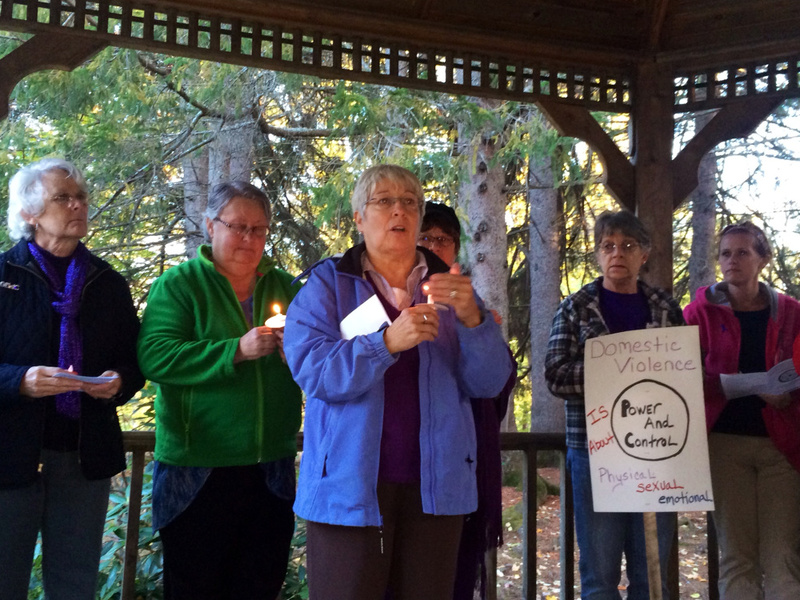 About 40 people attended the vigil at Coburn Park and many stayed for the discussion afterwards. Christina Gilman, 27, of Clinton, said that she, her mother and sister are victims in an ongoing domestic violence situation. Gilman did not want to give specifics about the abuse, but she said she felt an electronic monitoring bracelet would help their situation.